﻿ Proverbs 1:7 The fear of the LORD is the beginning of knowledge; Fools despise wisdom and instruction. The fear of LORD is the beginning of knowledge. The foolish despise wisdom and instruction. The fear of Jehovah is the beginning of knowledge; But the foolish despise wisdom and instruction. The reverent and worshipful fear of the Lord is the beginning and the principal and choice part of knowledge [its starting point and its essence]; but fools despise skillful and godly Wisdom, instruction, and discipline. The fear of the LORD is the beginning of knowledge, but fools despise wisdom and chastening. 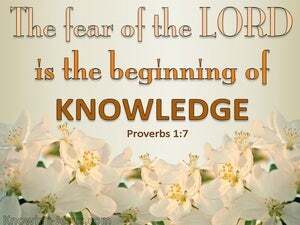 The fear of Jehovah is the beginning of knowledge: the foolish despised wisdom and instruction. Fear of Yahweh [is the] beginning of knowledge; wisdom and instruction, fools despise. 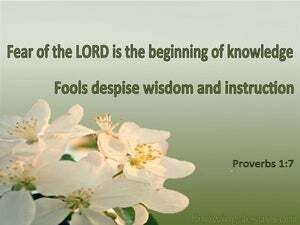 The fear of Jehovah is the beginning of knowledge; but fools despise wisdom and instruction. The fear of the LORD is the beginning of wisdom. But fools despise wisdom and instruction. Fearing the Lord is the beginning of moral knowledge, but fools despise wisdom and instruction. The fear of the LORD is the beginning of knowledge; but the foolish despise wisdom and instruction. The reverence of Yahweh, is the beginning of knowledge, Wisdom and correction, the foolish have despised. Fear of Jehovah is a beginning of knowledge, Wisdom and instruction fools have despised! "And to man He said, 'Behold, the fear of the Lord, that is wisdom; And to depart from evil is understanding.'" The conclusion, when all has been heard, is: fear God and keep His commandments, because this applies to every person. The fear of the LORD is the beginning of wisdom; A good understanding have all those who do His commandments; His praise endures forever. A fool rejects his father's discipline, But he who regards reproof is sensible.